I left Lairg with a spring in my step, my tummy was still a little bit tender but the end was now in sight; 77.5 miles to go. 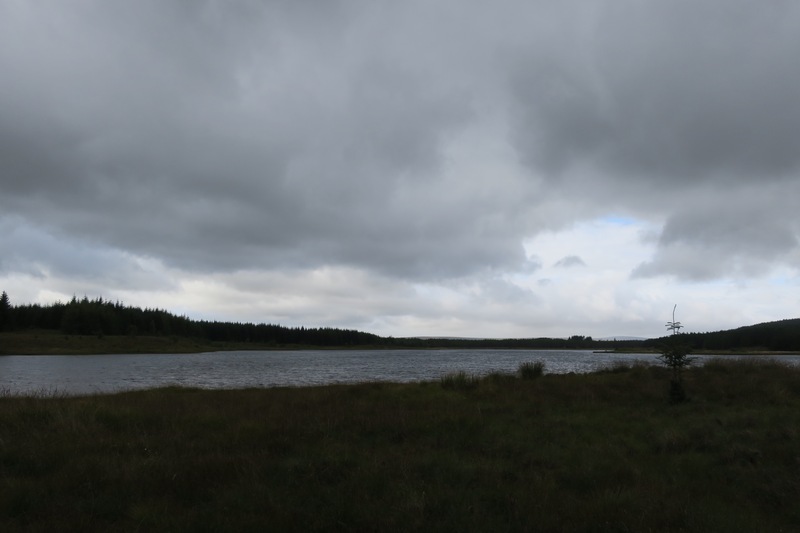 The first part of the route was along lanes around farms on the outskirts of Lairg and led to a couple of lochs on the boundary of a forest. Once in the forest the path petered out by Loch Tigh na Creige as expected, so I climbed the stile to a stream. The guidebook says “head uphill due north through a narrow gap in the trees…emerge through bracken onto a forest track”. Easier said than done – even with the tip that the author gave me back in Kinlochewe – I couldn’t find a particularly favourable route so I just waltzed into the densely planted trees. I managed to do ok until there was about 20 meters to go and a whole raft of trees had naturally fallen and blocked the route up and down. I could sense the path just the other side of the trees so rather than go all the way back pressed on. It was very slow going, sometimes on hands and knees with trunks, branches and twigs spraying out in all directions. At one point I crawled under a two adjacent trunks and when I stood up forcing my way through vegetation I felt trapped in a laser maze à la Mission Impossible. I almost couldn’t move, so I freaked out, snapped all the twigs in the vicinity and then looked for a way out. Luckily my senses were correct and the other side of this I found the track – phew! It was then a long march along a forestry track to the hamlet of Dalnessie. It’s a very remote place and I suspect they get snowed in for days (or weeks) at a time during the winter months. After a quick lunch stop of tinned tuna in a bread roll, I cracked on across and over quite a vast stretch of nothing rising to around 500m. Just bog and peat, a couple of streams and a few sheep. The plateau was mostly featureless but I managed to find the stream that led down the valley towards Loch Choire. It was still a couple of miles to go, I was feeling tired and I wanted to get to the bothy. A newly fenced area full with overgrown vegetation tried its best to slow me down, but before long I was trotting along on established path with the bothy getting closer with every step. In the valley was a huge herd of deer, around 100 or so, and when I stopped to take a picture, something caught my eye. I swung round and there were 2 walkers a hundred meters behind me. They rather made me jump – as I’d not seen anyone all day and wondered where they had materialised from – it turned out they had joined the path from the other fork where I had joined it and were also staying at the bothy. My bothy companions for the evening were Ursula and Alex, who had stayed the previous night too. It was a modest bothy but well maintained and stocked with firewood. After settling in and having dinner we whiled away the evening chatting in front of the roaring stove which kept the bothy nice and toasty. 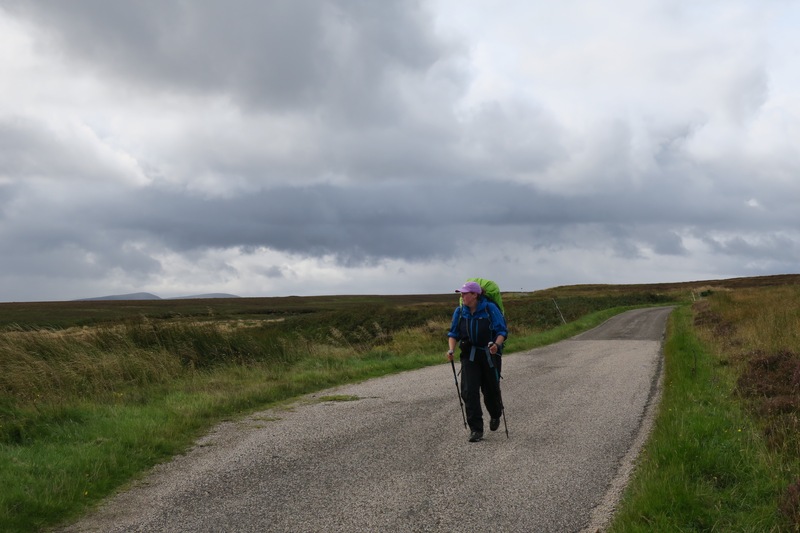 I learnt that Ursula is a hill walking fiend, and despite living in Cambridge and her advancing years, visits Scotland and the bothies regularly with Alex – who does the heaving lifting, literally. 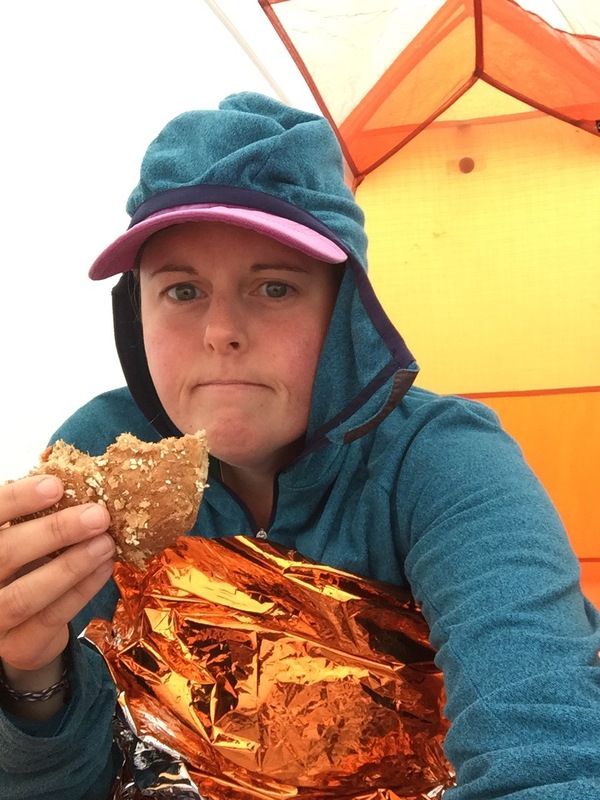 She has completed the Munros (x 282), the Corbetts (x 222), the Grahams (x 221), the Marilyns (x 1,217) and is now visiting the HuMPs (x 2,162 – of which she has about 300 left)! What a phenomenal woman. I was in such awe that if I were to open my mouth I would just gush, so I kept quiet. Now I wish I had gushed. If I’m half as fit and active as Ursula when I’m her age, I’ll be well chuffed. 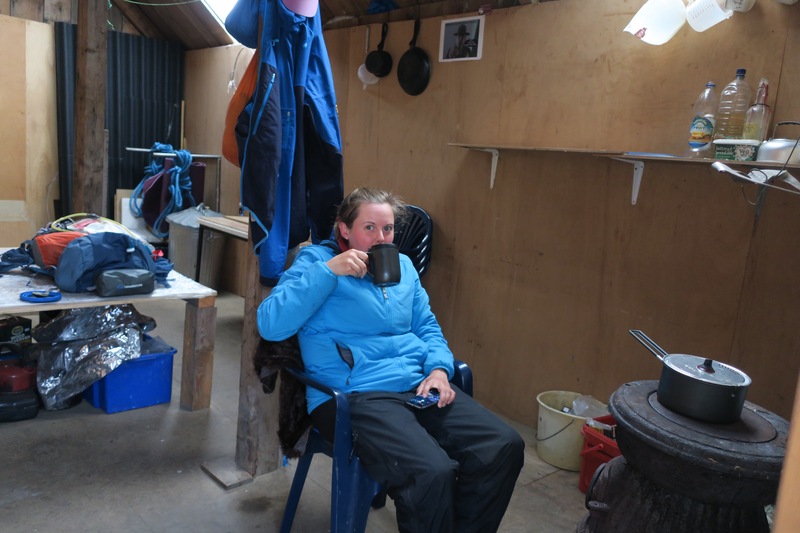 Having seen the weather forecast and it materialising in the morning with plenty of rain on the bothy roof I decided to stay put for the day where I was warm, dry and could continue to rest up. I’ve turned into a fair weather walker! There were some breaks in the rain, enough to tempt out Ursula and Alex who walked up the HuMP behind the bothy, returned for lunch, packed up and then set off back to the Crask Inn. I swept the bothy, napped, collected and cut some more wood and in the evening had another fire. In the morning it was warm, dry and a lack of wind brought out the midges but I enjoyed a nice amble all the way down the lochside. From the lodge, it’s 11 miles along the access track to the road, it was going to be tedious but there was a 2 mile section of footpath which cut off a corner and broke up the monotony. I took lunch on a jetty that stretched out on to the waters of a loch and just as I was finishing it started to spit. I wasn’t concerned. Once I eventually made it the road I was just 4 miles from Kinbrace, a very small hamlet with very few facilities or services, where I was going to find somewhere to wild camp. At 3:30 the rain got heavier and heavier and heavier. It was the kind of rain that bounces as it pummels the ground and within minutes I was drenched and not even a tree to be seen for shelter. An hour and a half later when it was still falling heavily and a number of cars had added upward spray as well as downward spray I was wet to the skin all over and had water running down my legs under my waterproof trousers which flowed into my sock and boots which now squelched. I arrived in Kinbrace desperate for shelter. Both churches marked on the map were locked but there was a train station with a bus shelter on the platform. I stood inside and starting thinking about my next move. There was no accommodation within 10miles. Wait for the rain to ease and find somewhere to pitch my tent? Pitch my tent in the bus shelter? Knock on a door and ask for help? How could I dry off anything? I then realised I was at a train station and there were 2 trains scheduled for the rest of the day and they were imminent; 1 northbound and 1 southbound. Somehow I had a 3G signal and I could do some quick research. Within an hour I was checking into a budget hotel in Helmsdale and was very relieved to be staying somewhere warm and dry. I spread my kit out everywhere and set the little electric heater to max. Even by morning most of my things were still wet, but drier than they had been. I’d hate to think of the state I’d have been in if I’d camped on wet ground too. I got on the first train back to Kinbrace which arrived at 10:10 but given I only had 13.5miles I didn’t think it was a problem. 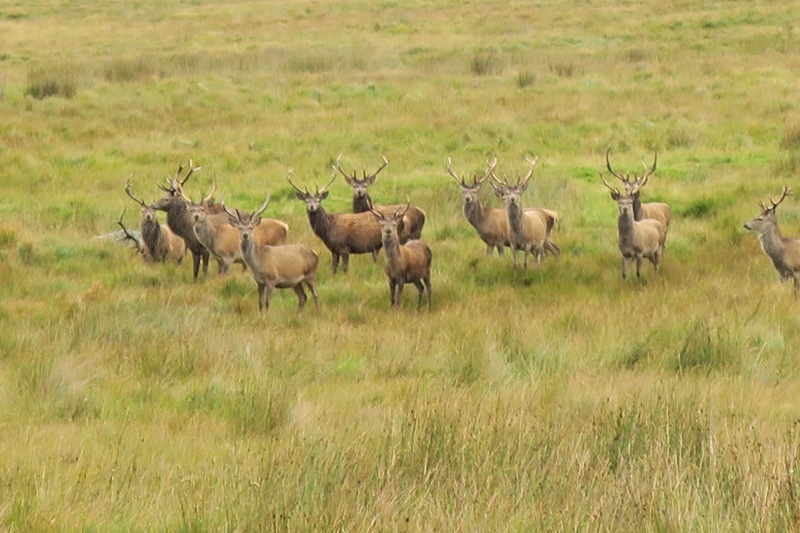 Once I turned off the road it was more pathless, boggy terrain with a few sheep dotted about and a huge herd of deer. I started heading up along a stream and the wind was picking up and bringing with it some dampness in the air. 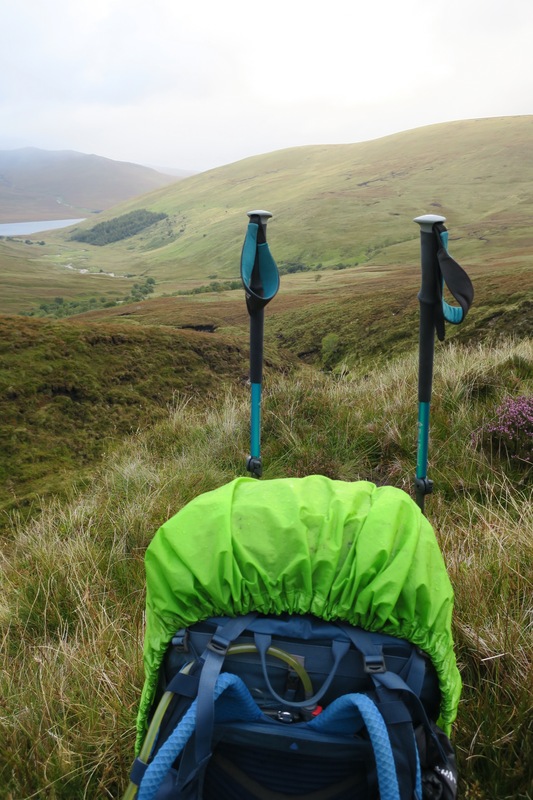 Upon reaching the top; a large peat hag plateau (it felt remarkably like Kinder Scout), the rain really came over and I decided I didn’t want a repeat of yesterday and so just stopped in my tracks and pitched my tent. Amazingly I had 4G so I checked the weather and it was due to pass relatively quickly. It was around 13:30 so I ate lunch and wrapped myself in a foil blanket to try to keep warm. The rain was heavy and consistent until 15:30 when it practically stopped so I leapt out and packed a very wet tent. 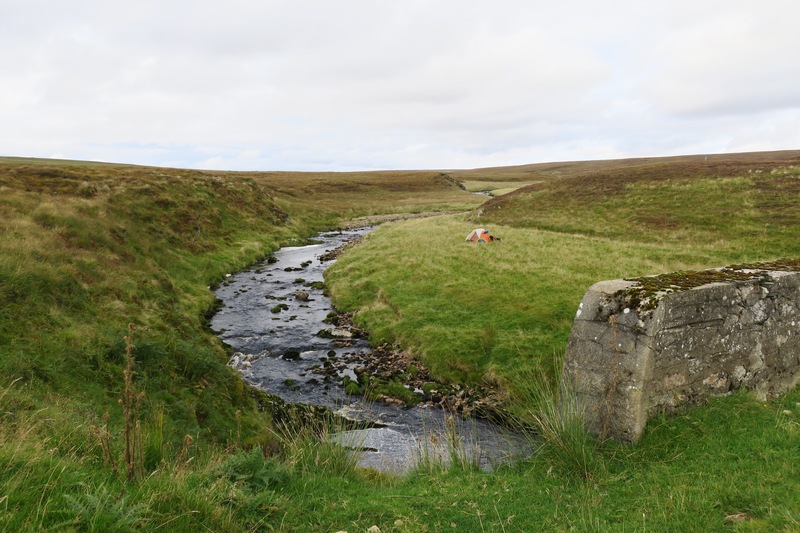 I found the trig point among the peat and mist and then picked up the stream that would lead to an estate track. The pathless riverside seemed to go on forever but it did eventually meet the track. I immediately started romping down as it was about 17:30 and time was getting on a bit – so much for a relaxed day! I came across a nice summerhouse type structure just as a cloud blew across bringing more rain with it. It was open so I let myself in. It was clearly an estate picnic house and it was very smart inside; including tartan cushions, a Weber gas barbecue and an electric heater. If the rain carries on, could I stay? Perhaps. Well the rain stopped so it wasn’t required and off I went again racing the next rain cloud. 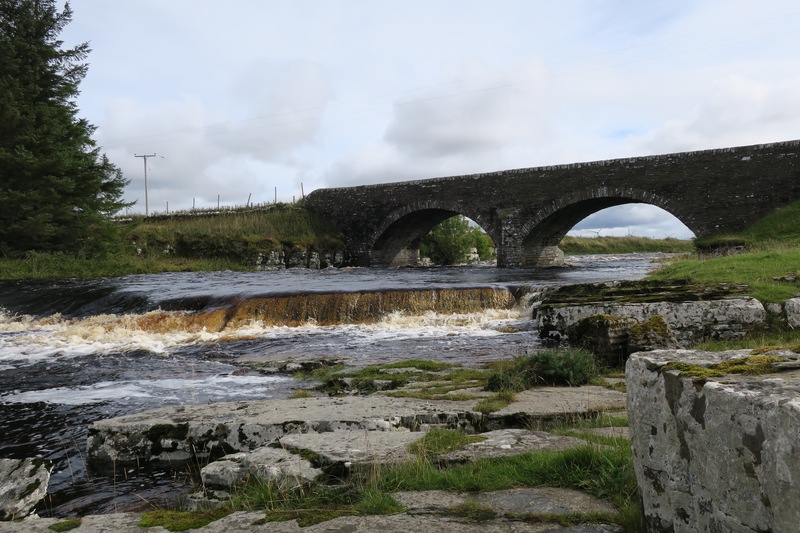 I strolled past a set of estate buildings called Glutt Lodge and then 2 miles on, just short of where I intended to camp – which was in the broad valley of the River Thurso – there was a sheltered spot by a bridge before the confluence of 2 rivers. I pitched my very wet tent, but it was now a nice evening so it dried off a bit, had dinner and went to bed. Knowing that the weather was due to be bad the next day, if it was raining in the morning I would stay put and move on once the weather improved. I was now very conscious of it being the end of day 97 and having only 3 days of walking left, making it a nice round 100, I didn’t want to have to bail out on a day, making it a half day and therefore 101 days. Well the forecast was wrong! Shocking I know. Sunday didn’t turn out to be so bad, there was rain but it was showery and probably would have been ok. But since it was going to be a 20mile day, once it got to 11am when the rain first cleared I didn’t think it would be good to set out that late. So I stayed put and somehow found ways to occupy myself for a full 24hrs. I read, did some sudokus and put some serious thought into food rationing. Also the estate game keeper came and said hello, which was nice. Well he was just checking that I was alive; ‘you do get stiff ones every now and again’. I set my alarm so that I could leave promptly the next morning. 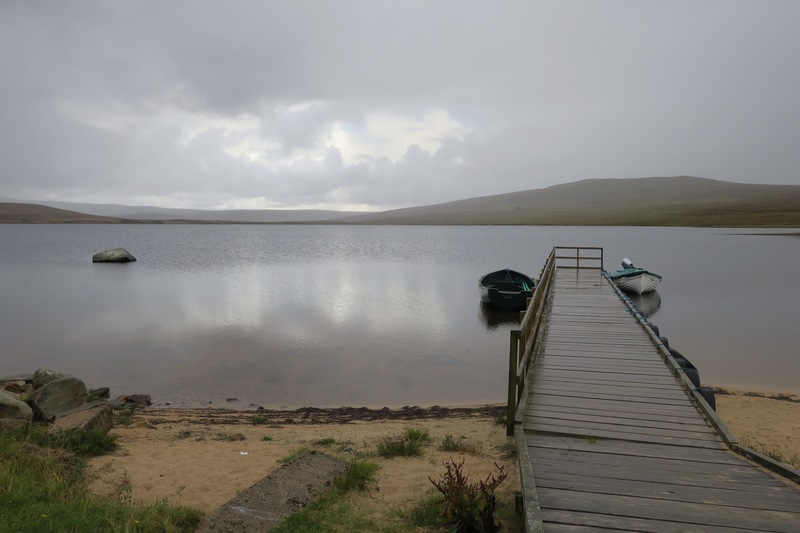 I needn’t have bothered with the alarm – I was awake most of the morning hours with rain hammering down on the tent and the wind whipping through too. Perhaps the worst of the weather was 24hrs late? It was far worse than the previous day so I was in for another long stint in my tent with diminishing food supplies. Overnight the river had risen from a tame trickle to more of a rush but I was still a little way away and I checked it every so often. At around 10:30 the game keeper swung by again in the pouring rain and said that the river would continue to rise and could well reach the level of my tent. I thanked him and did not hang about, I could see it had risen considerably since the last time I’d checked; it was now a torrent and I didn’t want to take any risks. 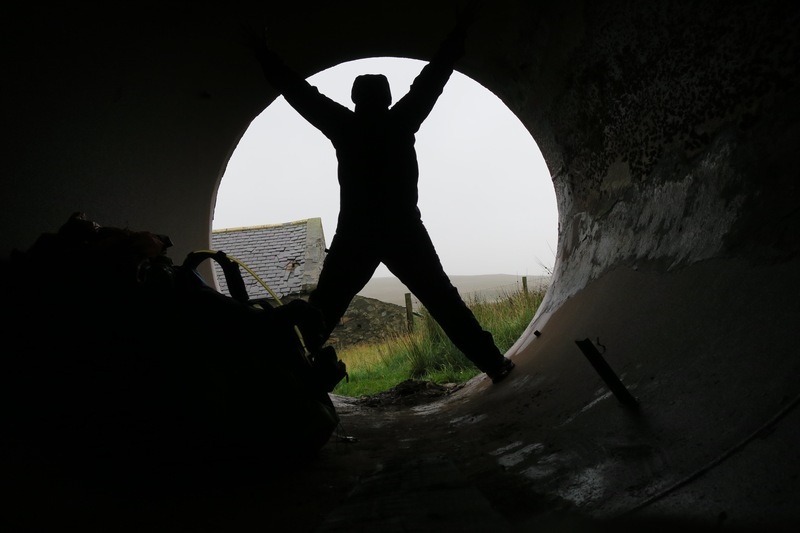 I hurriedly packed up and headed for the shelter of a nearby derelict cottage with outbuildings and what appeared to be an old and empty silage tank on its side. I settled down in the old tank, doing star jumps to keep warm and found a flat-ish, dry-ish and sheltered-ish piece of ground that I would pitch my tent on, should the weather ease at all. The game keeper then passed by one more time (he’d been on his weekly 52mile round trip to the supermarket!) and he offered me the shelter of his cottage at Glutt; a spare bed, hot food and somewhere to dry my tent. I didn’t hesitate. We had a cup of tea in his kitchen and chatted, his name was Gus (originally from Derbyshire) and this was his forth season as the game keeper out here. Over the course of the day I learnt about stag hunting, grouse shooting, falconry, estate life and pointers (he had 3 English pointers; Pluto, Tosh, and Gromit the 14week puppy and an English setter; Broch). In the afternoon, some clients of a neighbouring estate came over in the hope that Gus could take his peregrine falcon out to catch a grouse. 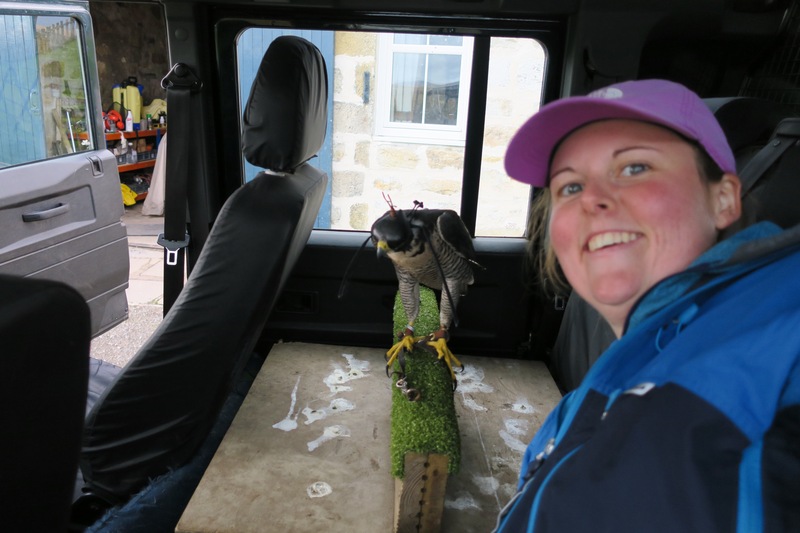 I went along and although Tosh was able to point out a grouse it was too windy for the falcon, but I certainly enjoyed the privilege of a ride in the back seat of the Land Rover with the falcon! Gus served up steak and veg for dinner accompanied by beer and we watched university challenge in front of a raging peat fire. What a saviour! Me walking – first time I thought about doing this, better late than never I suppose! Well, the penultimate day. I knew it would be a relatively short day so I didn’t rush off, initially went past Watten Loch and it was more of the same from yesterday; farms, sheep, cows, wind turbines, roads and therefore cars. The guidebook does give a much more road free alternative to yesterday and today but ‘difficult going’ through the Moss of Killimster didn’t take my fancy. I relished in it being easy – if a little boring – even though I had to contend with big metal box-type things coming towards me at 30-40mph. 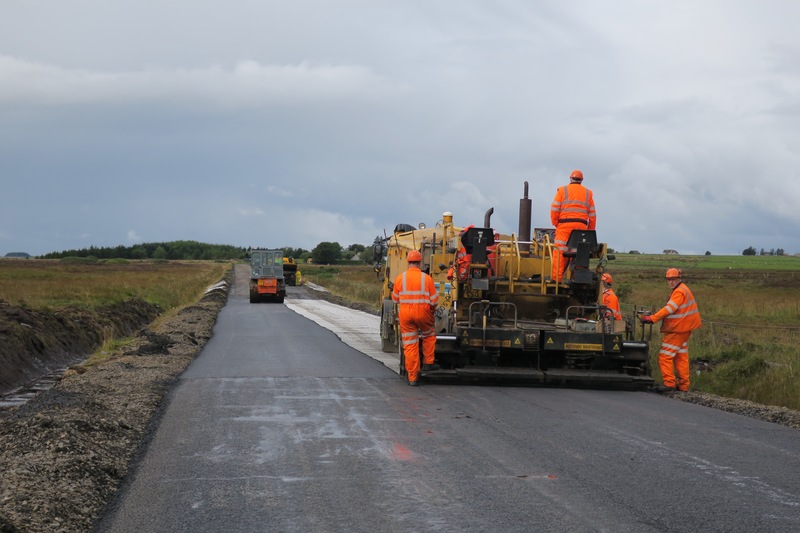 At one stage the road was closed for resurfacing and I didn’t fancy taking the long diversion, so I brazenly strode through the many signs and approached the workmen who said I could walk by on the verge. Good job I heeded their advice because the freshly laid tarmac was so hot and still steaming that had I walked on it it would’ve melted the rubber soles of my boots and I’d have been stuck! Roadworks ain’t going to stop me now! A little further on a rain shower came over but there was an open barn so I took shelter for a few minutes and ate my last haribo. 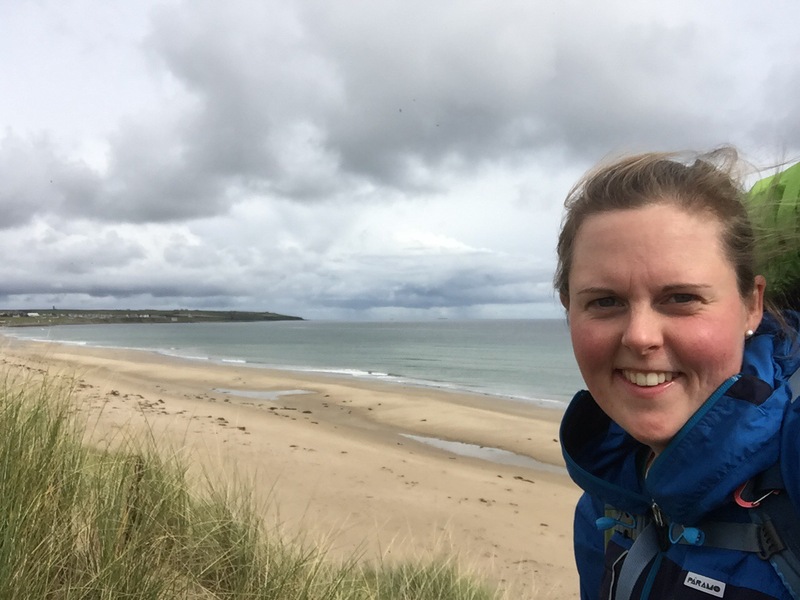 Very soon after the coast came into view and before long I was scrambling up the sand dunes – amongst cows! – and down the other side into the beach. Being on the beach felt very significant as I hadn’t walked on the sand since Cornwall and being the second to last day was also conjuring up all sorts of emotions. After a picnic on the beach I wandered up to Keiss and checked into the hotel then headed out to see the sights of Keiss. That took all of about thirty seconds, unfortunately there’s not a lot going on in Keiss. There’s the harbour, the castles old and new which I would see tomorrow and that’s about it – I didn’t think I should be seen checking out the primary school around going home time. The only shop had closed down so I nursed a pint in the bar, had dinner in my room and went to bed. Big day tomorrow!